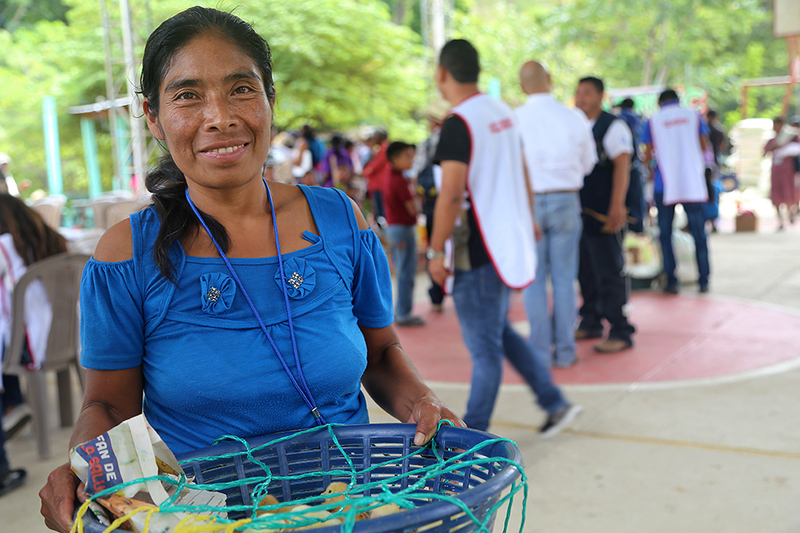 When a drought hit Guatemala in 2015, worsening the hunger problem among the country’s indigenous people, Maria Ermelinda Vásquez Ramírez received cash assistance from Catholic Relief Services to buy food and other household essentials. The rice, beans, pasta and milk she bought using electronic vouchers at a local store have been “wonders from God,” says the mother of eight children. Since then, the drought has dragged on in Central America’s Dry Corridor—--a large region in Guatemala experiencing extreme weather conditions--—shrinking harvests and household incomes. Superamos, the U.S. Agency for International Development-funded emergency response project that helped Maria, remains in operation. In November, Maria received vegetable seeds and her second batch of chickens at an agricultural fair hosted by CRS and our Caritas partner. She sells the chickens for extra money and feeds her family with the cilantro and cabbage she grows in her garden. But it’s not the food or the money that have changed Maria’s life the most. What has made the biggest difference for Maria and her family is that she no longer has to leave home each day to pick coffee from sun up to sun down on plantations two hours away. For the first time in years, Maria is able to stay home to care for her children, who range in age from 2 to 21. Meager rainfall in the Eastern department of Chiquimula makes it hard for families like Maria’s to grow enough corn and beans to last the year. Most families, including Maria’s, have not produced a full harvest since the drought hit four years ago. As a result, some have resorted to drastic survival tactics, such as skipping or reducing the size of meals or selling their machetes and shovels. “This is the worst-case scenario for families in need.,” says Rosa Joo, who oversees the Superamos project for CRS. Joo says a survey conducted at the start of the project found that 84% of families had experienced hunger. That’s why Superamos prioritizes assistance to vulnerable households that include pregnant women and those with children under two years old. 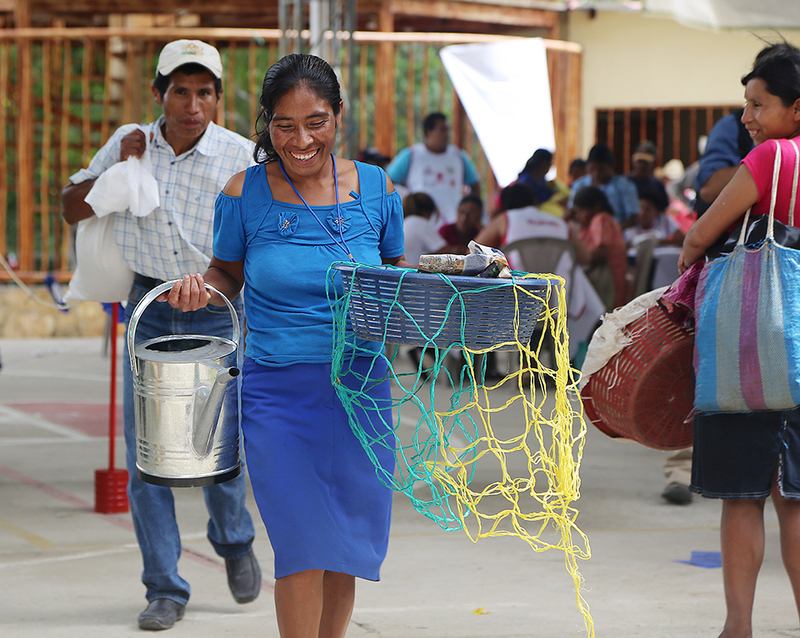 In addition to providing nutritious food, which participating families can buy using an electronic card at local shops, Superamos organizes a series of fairs for much-needed agricultural products and tools. Families use vouchers to buy seeds, farming tools, fertilizer and other items as well as baby chickens. Purchasing locally helps stimulate the region’s economy and allows families to choose the items they want. The women and men who participate also receive education. Through demonstration sessions, they learn to recognize symptoms of acute malnutrition and other illnesses, and how to select food and prepare nutritious meals. 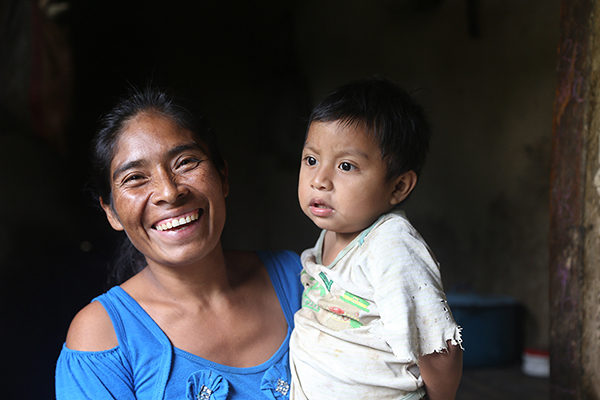 For Maria, those lessons have helped keep her two-year-old son, Oblin Omilio, healthy. A year ago, he dropped 5 pounds, putting him dangerously close to being malnourished. Maria and her husband, Ovidio Gutiérrez Ramos, immediately sought help from the local health clinic and were told by the nurse to give the boy an egg a day and to put sugar in his milk. Luckily, she had egg-laying hens from the Superamos project and enough extra cash to buy the sugar. He gained the weight and recovered quickly. But the experience scared the couple, who lost a baby just 13 days after he was born prematurely, at 7 month’s gestation—they think because Maria herself was too undernourished and overworked to bring him to term. Maria thinks it was the 14-hour days she spent picking coffee that made her too weak to carry the child. The paltry $110 she earned per month hardly made up for the anxiety she felt over leaving her children at home alone. Oblin was born 6 years later. Today, life is very different for Maria and her family. Watch a video about Maria.